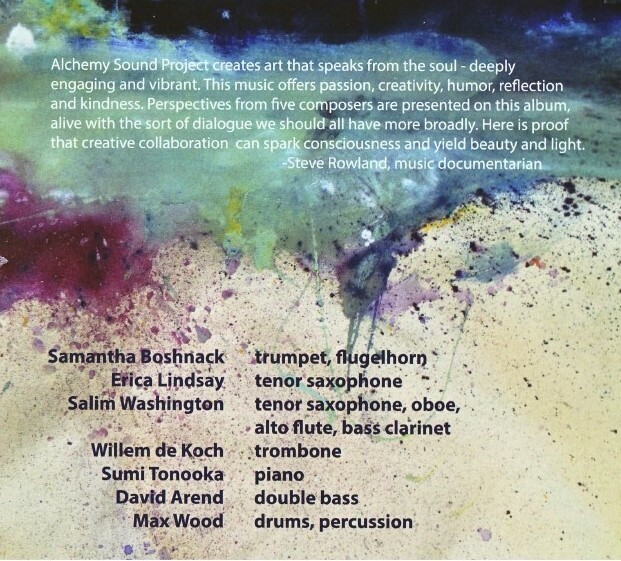 The excellent new project from Alchemy Sound Project featuring five extraordinary composer/performers: Sumi Tonooka, Erica Lindsay, Samantha Boshnack, David Arend, and Salim Washington. 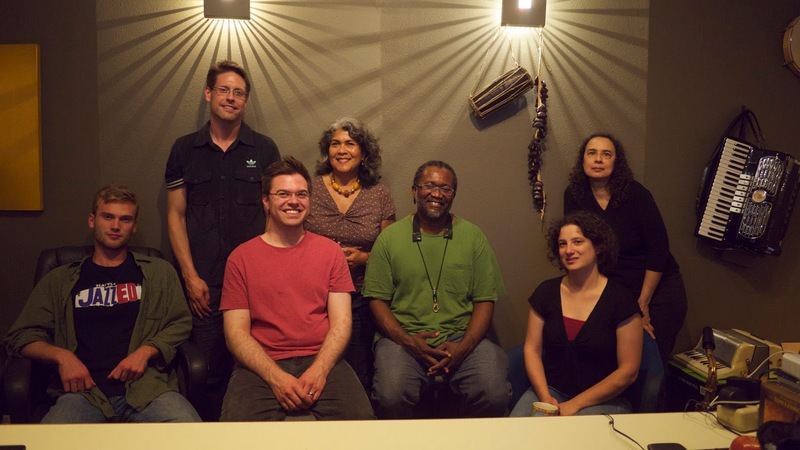 The five core members of Alchemy Sound Project were brought together by the Jazz Composers Orchestra Institute, a program initiated by the American Composers Orchestra and the Center for Jazz Studies at Columbia University to encourage jazz composers to explore writing music for the symphony orchestra. Directed by composer/trombonist/educator George Lewis, JCOI selects 38 jazz composers at various stages of their careers, chosen from a competitive national pool of applicants, for a one-week summer intensive with leading composers, conductors and performers. 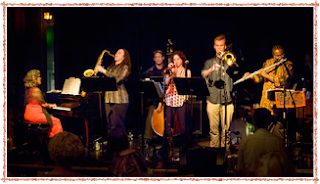 Works by Erica Lindsay, Sumi Tonooka, Samantha Boshnack, David Arend, and Salim Washington, composers brought together by Jazz Composers Orchestra Institute. Medieval alchemists were known to have sought a way to turn lead into gold, but the actual purpose of their experiments was to transform the very soul of the alchemist. 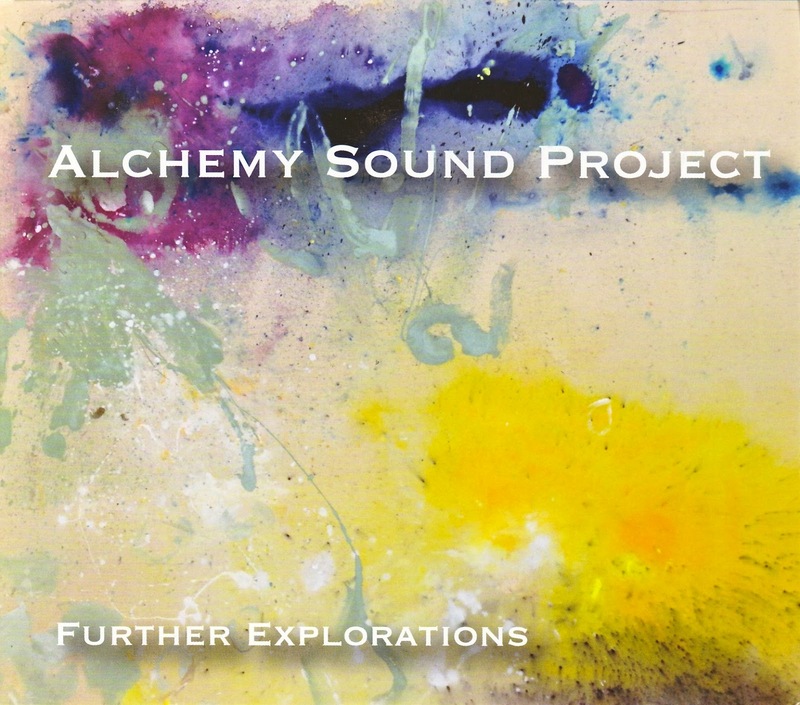 Alchemy Sound Project follows a similar course, experimenting with combinations and distillations of jazz, African traditions and Western classical music in an effort to transform themselves and their audience. 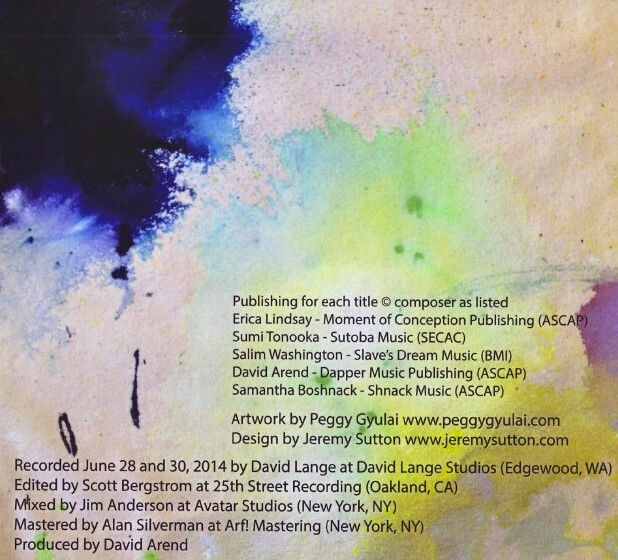 On Further Explorations, the band's debut due out May 27, 2016 on Artists Recording Collective, five composer-musicians and their invited guests find a way to meld their distinctive approaches and voices to create a unique sound with the lushness and intricacy of a symphony orchestra combined with the spontaneity and interplay of a small jazz group. Alchemy, indeed. Tenor saxophonist Erica Lindsay attended the first JCOI session in 2010; at her encouragement, both pianist Sumi Tonooka (a frequent collaborator) and trumpet player Samantha Boshnack (a former student of Lindsay's at Bard College) enrolled in the second round in 2012. There, Tonooka and Boshnack met and bonded with bassist David Arend and multi-reedist Salim Washington. By day they studied aspects of music history and the orchestral palette, while by night they shared inspiration over dinners and walks around the UCLA campus. A year later, the five reconnected at Tonooka's behest to further explore the ideas they'd studied in the program. "It was a very intense experience," Tonooka says of JCOI. "It got me really excited about being able to apply my own experiences to the instrument that is the orchestra." For their debut release, each composer was encouraged to bring in two new pieces for the group, supplemented for the recording by trombonist Willem de Koch and drummer Max Wood. The result is an artful and boundary-stretching amalgam of jazz and classical ideas that shows off the chemistry formed during the bandmates' brief but enlightening time studying together. "The JCOI concept is about blurring these lines, hybridizing jazz elements with classical music," Arend says. "It's up to us to figure out what that means, but the synergy of the band is awesome - we're inspiring each other, teaching each other, pushing each other, and it feels like new territory even though we're drawing on centuries-old traditions." 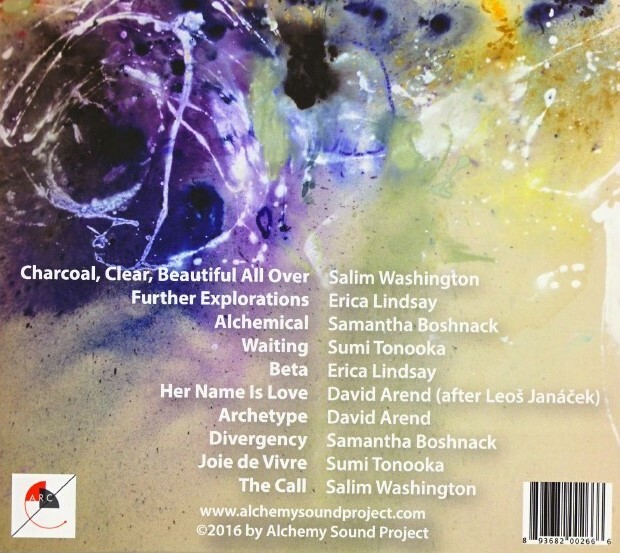 The connection between the Alchemy participants is exemplified by Washington's "Charcoal, Clear, Beautiful All Over," which opens the album. The title is taken from the English translation of the Japanese name "Sumi," while the piece itself was penned to spotlight the bass clarinet, Tonooka's favorite instrument. Washington, a Professor of Music at South Africa's University of KwaZulu-Natal and a collaborator with jazz visionaries like the late Fred Ho, also contributed the closing track, "The Call." The tune was written in tribute to Solodeen Muhammad, whom the composer calls "one of the hipsters of my father's generation. This piece is in his honor and in appreciation of the psychic and spiritual support, the cultural continuity that he represents in my life as a musician. It attempts to channel the hipness and the energy that this streetwise, musically savvy father figure has passed on to me." Lindsay, an artist-in-residence and teacher at Bard College who has performed and recorded with artists ranging from McCoy Tyner and Oliver Lake to Frank Zappa and Melba Liston, says that her piece "Further Explorations" is intended to "connote a journey of discovery" that parallels the creative act. The richly-hued piece, which slowly builds from a tense alto flute theme over a bass/drum pulse to accumulating horns, contrasts moments of free improvisation with lush composed sections. The piece, Lindsay explains, "explores the balance and necessary tension between the unknown and the known that exist within the creative mind. As one sets out to leave the known world and fall into unknown territory, there is a certain wonder and innocence involved as well as the courage to let go of the known." Lindsay's second piece, the sprightly "Beta," is more through-composed, though it carries the playful dodge-and-weave energy of the written lines into its solo sections. "I was listening to a lot of orchestral works as I was writing," says Boshnack, "and trying to incorporate and highlight classical counterpoint and grandeur in my music. I was listening to and inspired by the music of my colleagues and trying to give them a space in which to shine." A mainstay of the Seattle jazz scene with her own B'Shnorkestra and as co-leader of Reptet. Boshnack begins her first piece, "Alchemical," with a fanfare of classical counterpoint for the horns and drums before bursting into a heavy groove, prompting intense solos from Tonooka and Lindsay. "Divergency" sets up a tension between light and dark, with airy melodies and starker rhythms. Both reflect the hybrid nature of the ensemble in their apt mash-up titles, combining alchemy and chemistry in the first, diversity and urgency in the second. Tonooka, a Philadelphia native now based in Seattle who has written symphonic and chamber works and film soundtracks in addition to working with jazz greats from Philly Joe Jones to Rufus Reid, set out to write two entirely different compositions for the band. The stunning, crystalline-then-jarring "Waiting" was born from a difficult personal situation, while the celebratory "Joie de Vivre" combines the composer's love of Malian music and the contrapuntal approach of composers like Bach. The most classically-oriented member of the ensemble, Arend is a longtime member of the Oakland Symphony as well as a composer and performer in jazz, electronic, avant-garde, and singer-songwriter contexts. He adapted "Her Name Is Love" from a piano piece by Czech composer Leo_ Janá_ek, reharmonized with piano removed from the equation entirely. The title of Arend's second contribution to this recording, "Archetype," refers to one of the most archetypal formats in jazz, the big band, the sound of which Arend recreates with the band's seven pieces. Each of these pieces is striking in its own right, but together Alchemy Sound Project provides thrilling new avenues for exploration - which its members are eager and committed to explore. "You could think of it like a dinner," Tonooka muses. "Everybody brings different dishes to the table and we're all enjoying and tasting and delving in and creating something new out of it. 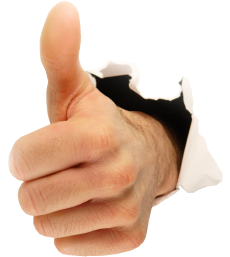 That makes it fun for us and interesting to the listener because it's not just one flavor. It's all of us."